I've been bad for the last six or seven months and haven't been shooting much at all. Last Sunday, I was downtown and waiting for my wife and grand-daughter so I went to Kensington to kill time and walked around. I passed one of the neighbourhood stores that deals in used goods of every description. 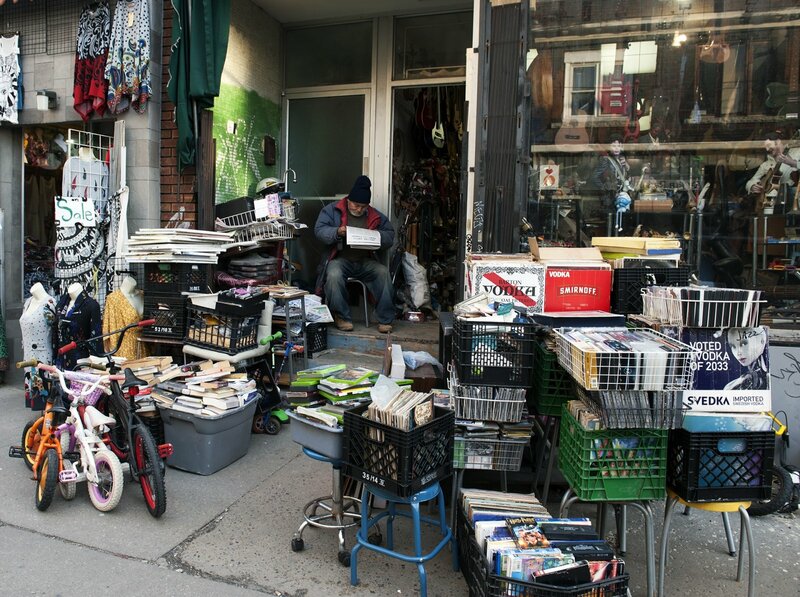 The owner always brings a ton of merchandise out onto the sidewalk, and then spends the day sitting on the doorstep reading the paper. I liked the story, and grabbed this shot. Nice shot, Robert. It looks like the kind of shop I like to visit. Although I am not really interested in the vinyl revival - no one will be able to convince me that it sounds better than CD's. While I can't speak to the issue of vinyl versus CD's, I can definitely say that this store is where I'd go to buy plastic statues of Elvis. If I really wanted plastic statues of Elvis. Gosh Robert, what a colourful potpouri of stuff that you have uncovered here! Sorry to hear that you have been unwell in recent times - may yourrecovery now be on the upward path. I must correct an impression I gave people here and at the other sites where I post because of a poor choice of language. I'm not ill. What I meant when I said I've been "bad" was bad as in "bad behavior" because for the last six or eight months I haven't been photographing very much at all. Instead I've been spending a lot of time re-learning to play my guitar, which I stopped playing about 40 years ago, and just recently took up again. It's a confluence of circumstances which resulted in a bit of a photographic slump after over 40 years of shooting that up to now I really haven't made a great effort to correct. I intend to start getting out and seriously crawling the streets again, camera in hand. I am so pleased that you are not ill.
Spike Milligan wanted the inscription "I told you I was ill" on his gravestone, but the local English council refused permission for this. So he translated it into Irish - "Dúirt mé libh go raibh mé breoite". The Council allowed this, not knowing what it meant! Fotozones is a place where folks who enjoy photography as a recreational pursuit are welcome to engage in conversion with other like-minded folks from around the world. We discuss the things we like to photograph, places we go to make them, techniques we use and to a lesser degree what equipment we like to use. Our aim is to remind people about the joy of photography regardless of brands and formats. So whether you use a phone or a large format film camera, if you love the act of photography this is the community for you. We don't aim to be a loud, noisy and enormous group of people all shouting over one another, but rather a quiet place of appreciation. There will never be more than 2000 registered members on this board, so if you see the sign-up links there is still space for you to join our community. We hope to have you with us.